Overtime rehearsals with stand-in bass player Pontus Egberg from Sweden is paying off. See you at Grona Lund - Stockholm, on the 25th! KING DIAMOND: recopilatorio "Dreams Of Horror"
"Dreams Of Horror" es un recopilatorio de 23 canciones seleccionadas y "remasterizadas" por King Diamond y Andy La Rocque, será lanzado por Metal Blade Records el 11 de noviembre. "Dreams Of Horror" se compone de dos discos que abarcan las épocas de las discográficas Roadrunner y Metal Blade. "Dreams Of Horror", a 2xCD collection of KING DIAMOND songs, newly enhanced into ultimate editions by King Diamond and Andy La Rocque themselves, will be released by Metal Blade Records on November 11. 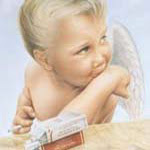 "Dreams Of Horror" is the only "best-of" album covering the band's entire career. King Diamond and Andy La Rocque meticulously mastered and enhanced these 23 songs into the ultimate editions, chosen by the band from both the Roadrunner and Metal Blade catalogs. King Diamond‘s “Dreams of Horror” is the only “best of” album covering the band’s entire career. King Diamond and Andy LaRocque meticulously mastered and enhanced these 23 songs into the ultimate editions, chosen by the band from both the Roadrunner and Metal Blade catalogs. “Dreams of Horror” will be available on November 11th. Listen to “The Puppet Master” from disc 2 of “Dreams of Horror” and pre-order a copy now at metalblade.com/kingdiamond. KING DIAMOND lanzará un DVD / Blu-ray de su gira "Abigail In Concert 2015"
KING DIAMOND filmará algún concierto de su gira de otoño para un futuro Blu-ray / DVD. El director Denise Korycki (Cannibal Corpse, Killswitch Engage) ha sido elegido para el proyecto, que incluirá imágenes de varios conciertos de la gira "Abigail In Concert 2015". Filadelfia (25 de noviembre en The Fillmore) y Detroit (28 de noviembre en The Fillmore) han sido seleccionadas como las ciudades en que se filmarán los conciertos de la gira "Abigail In Concert 2015" para el próximo DVD de King Diamond. Denise Korycki (Cannibal Corpse, Killswitch Engage) será el encargado de dirigir el proyecto, que incluirá imágenes de varios conciertos de la gira. In other news, Philadelphia and Detroit have been selected as the cities at which King Diamond will film the live shows for the forthcoming DVD. The massive, multi-camera shoot, will be directed by Denise Korycki (Cannibal Corpse, Killswitch Engage), and will also include additional footage from multiple shows throughout the entire “Abigail in concert 2015″ tour. Tickets are on sale now for all shows, so pick them up soon before they sell out! Neil Turbin (ex-ANTHRAX) realizó recientemente una entrevista a Andy La Rocque (guitarrista de King Diamond) para The Metal Voice. Se puede ver el video abajo. Hablando de cuándo King Diamond comenzará oficialmente a trabajar en nuevo material, Andy comento: "He estado muy ocupado [con la producción de otras bandas en mi estudio en Suecia] hasta que fuimos al Mayhem tour este verano. Estaba muy ocupado hasta entonces. Y al regresar de la gira de Mayhem, creo que sólo he estado en el estudio como tres días, ya que hemos estado ocupados preparando esta gira. Pero en realidad, vamos a tener un poco de descanso después de la gira, y luego vamos a empezar a escribir música para el próximo álbum." Él continuó: "Tenemos algunos riffs, pero una vez que empezamos el proceso, será una tormenta de ideas con todo el material. Así que será en algún lugar, supongo que tal vez en febrero, cuando empezaremos con ello.". Former ANTHRAX singer Neil Turbin recently conducted an interview with KING DIAMOND guitarist Andy La Rocque for Canada's The Metal Voice. You can now watch the chat below. 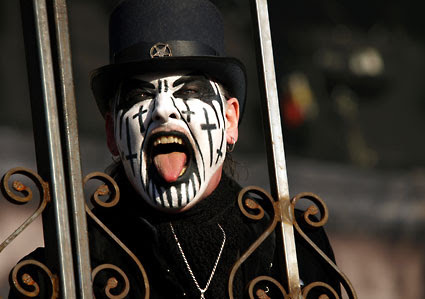 Speaking about when KING DIAMOND will officially start working on material for the follow-up to the band's 2007 album "Give Me Your Soul...Please", Andy said: "I've been really busy [producing other bands at my studio in Sweden] until we went on the [Rockstar Energy Drink] Mayhem [Festival] tour this summer. I was really busy until then. And since we got back from the Mayhem tour, I think I've only been in the studio for, like, three days, because we've been so busy preparing for this tour. But, actually, we're gonna have a little break after this tour, and after that break, we're gonna start writing music for the next album." He continued: "We have some riffs, but once we start getting into the process, it's gonna be brainstorming and all that stuff. So it's gonna be somewhere, I guess, in maybe February, we're gonna start doing that." KING DIAMOND: detalles de su nuevo DVD / Blu-ray, "Songs For The Dead Live"
El 25 de enero, King Diamond lanzará un nuevo DVD / Blu-ray, "Songs For The Dead Live", a través de Metal Blade Records. 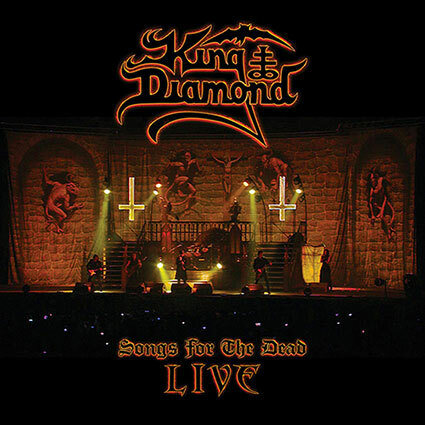 On January 25th, King Diamond will release a new DVD/Blu-ray, Songs For The Dead Live, via Metal Blade Records. There is only one King Diamond, and for more than thirty years the great Dane has been dropping classic albums and putting on shows fans remember for the rest of their lives. Perhaps the only downside to having such a formidable catalogue is that there are just too many great songs to fit into a single set. However, you would be hard-pressed to find a fan who wouldn’t want to hear 1987′s seminal Abigail in its entirety, and Songs For The Dead Live captures this, twice, and in very different locales. 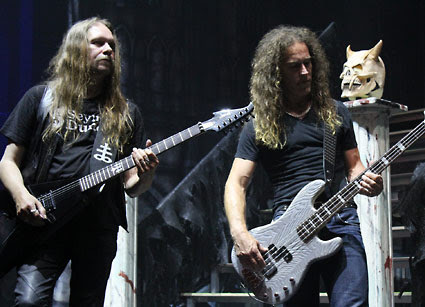 Boasting eighteen songs per set, each of the two shows – Belgium’s Graspop Metal Meeting in June 2016 and Philadelphia’s Fillmore in November 2015 – feature a brace of classic King Diamond and Mercyful Fate tracks including “Welcome Home,” “Halloween,” and “Eye Of The Witch” before launching into Abigail. The performances of the all-star lineup of musicians, comprising of guitarists Andy LaRocque and Mike Wead, bassist Pontus Egberg and drummer Matt Thompson, are absolutely ferocious, hammering home every single moment. Captured on film by director Denise Korycki for Wild Wind Studios, she worked closely with King on every aspect of filming, and throughout the viewer finds themselves front and center as the shows unfold. This includes some inventive camera placement, such as riding in on the back of the wheelchair as it is wheeled out to “Out From The Asylum” at the start of the show, or looking up from the coffin at the commencement of Abigail opener “Funeral”, which adds an extra dimension to proceedings. Naturally, the theatricality that has become synonymous with King Diamond is there in full force, making for an even more immersive experience. The gothic stage set and the participation of actors playing out certain scenes tying into the songs definitely increases the drama and the sense of complete disconnect from the trappings of reality, ensuring that the shows remain riveting from start to finish. KING DIAMOND: video adelanto de su nuevo DVD / Blu-ray, "Songs For The Dead Live"
"A Mansion in Darkness (Live at The Fillmore)"